The conventional material choices are plastic and nylon. Nylon guitar picks are thought by some to have a brighter sound. Plastic picks are hard to pin down because they come in a large number of variations. Tortex picks for example attempt to emulate the feel of the now banned tortoiseshell material. Their surface is somewhat powdery, allowing for a better grip. Pick materials are not limited to plastics and nylon. Some striking variations include metal, wood and stone. Metal picks can provide a crisp, snappy sound. If you have ever tried using a quarter to play, imagine that effect but more controlled. Wood picks are also a good alternative to plastics. They have a comfortable feel, and can offer any number of sounds due to the sheer variety of woods there are. Along with the standard pick some common shapes include smaller variations such as the teardrop. The standard guitar pick gives a lot of pick to work with as well as a secure grip, but players who haven’t experimented with alternatives may discover that they have been missing out. The Dunlop Jazz Pick for example is about half the size of a regular pick, pointier and beveled to allow quicker release from the strings. This pick and other pointy small picks provides an entirely different playing experience. Due to the closer proximity to the strings it feels like you are a step removed from finger picking. Pinch harmonics can be done easily and consistently by digging in more with your pick stroke. In some ways, the pick feels more secure because it is easy to cover the entire pick with your grip. It is worthwhile to experiment with pointier picks both small and large. Teardrop shaped picks generally offer a very similar experience to other smaller picks, simply providing another option for the curious. Some guitar picks are equilateral, providing a playing edge on each side. Depending on the size and thickness they can feel somewhat unstable due to their large size. The Big Stubby is a 3.5mm equilateral pick that fights this with a heavy gauge and an indent where the fingers are placed. When it comes to pick gauges, it is common for guitar players to float between a medium to medium-heavy thickness, around .4mm to .8mm. However, going beyond this range offers a variety of unique tonal benefits. When you go to either end of the spectrum, very heavy or very light, audible pick noise is added. On the very light side you get a sort of raking or brushing sound and on the heavy a kind of clicking noise. The brushing sound of light picks provides a nice effect for strumming chords. The downside of very light picks is that single note lines can lack definition, especially as speed increases. Due to how much the pick bends, accuracy starts to become difficult. These downsides really start to show in high gain situations where every aspect of your sound is amplified. A heavier guitar pick is more versatile. Where as it becomes difficult to add volume to a light gauge pick at a certain point, it is easy to subtract volume from the heavier pick. Additionally, heavy picks have much less give. This means you can hold the pick lighter and expect that it will not bend upon contact with the string. Picks above 1mm are where you start to see these benefits really clearly. However, once you go above 1.5mm you may start encountering some unfavorable pick clicking depending on the particular pick you are using. 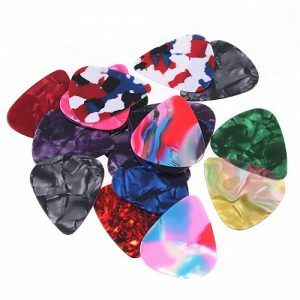 In addition to the conventional guitar pick options, there are a number of unique variations from the shark-fin pick to an array of thumb picks. It is important to try as many picks as you can in your lifetime. You may find that your ideal pick is something completely unexpected.